Sometimes the best way to explore a neighborhood is through its desserts. The Meatpacking District, known for its charming cobblestone streets and trendy shops, is a great place to visit this summer when looking for a chocolatey treat that goes above and beyond. 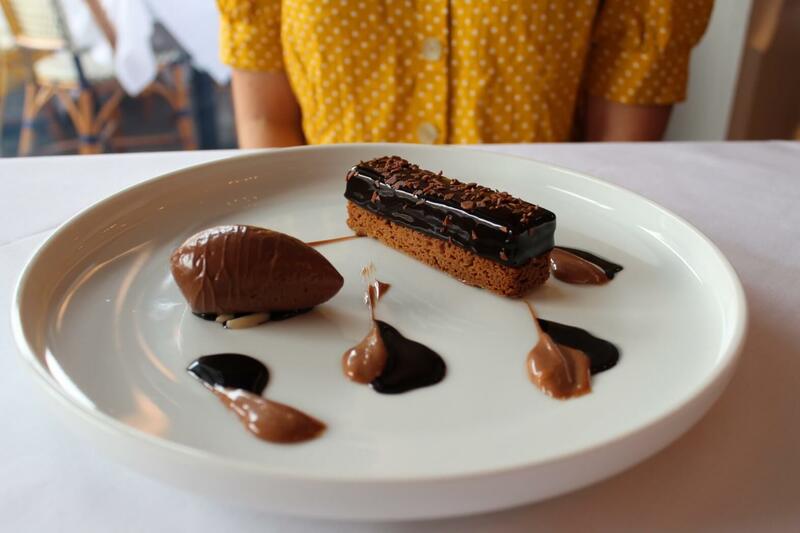 The ‘Dark & Milk Chocolate Bar’ is a new addition to Bagatelle’s dessert menu but tastes like a recipe that’s been perfected for years. 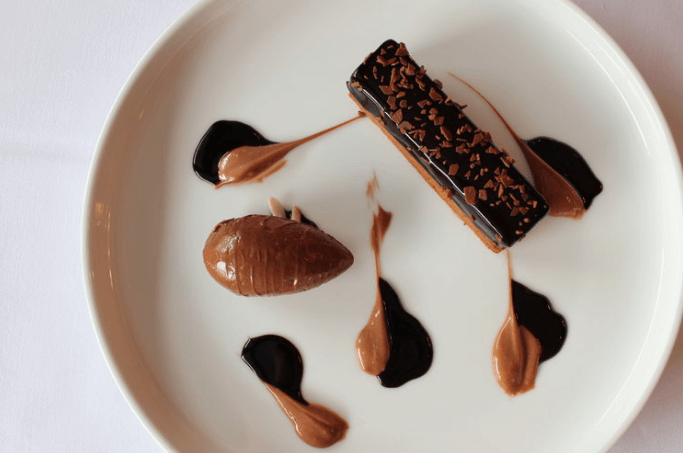 Served on a large white plate with decorative milk and dark chocolate swirls, the cookie bar rests to one side and a dollop of freshly churned chocolate ice cream on the other. The presentation of the dessert reflects the composition, which is all about balance between milk and dark chocolate. For the final touch, pastry chef David Zaquine shaves thin ribbons of fresh milk chocolate on top. With each bit of chocolate he slices off of the larger bar comes the aroma of a candy shop, fresh cacao and sugar, wafting through the air. The sight and smell are enough to make anyone’s mouth begin to water. A bite of the cookie bar paired with a sliver of ice cream only heightens the experience, mixing dry with wet and warm with cold. Needless to say, the ‘Dark and Milk Bar’ at Bagatelle masters the art of combining flavors and textures, creating a chocolate dessert as elegant and refined as the restaurant itself. A short walk away from Bagatelle is a petite shop with a purple awning and a friendly small-town atmosphere called Sherry B Dessert Studio. Sherry B’s has everything from booze infused marshmallows to blondie stuffed brownies to a giant s’more bigger than your head. Even though the options present a tough choice, there’s one dessert that the shop offers that’s a must-try for summer: ice cream sandwiches. The Sherry B Dessert Studio version of the ice cream sandwich is anything but average. Each one is made from fresh churned ice cream pressed between actual slices of cake. 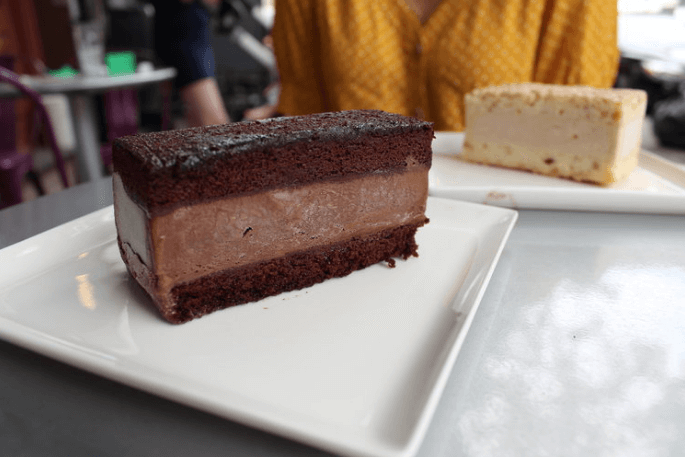 If you’re a true chocolate lover, you’ll want to try the ‘Blackout’ ice cream sandwich with dark chocolate ice cream and thick dark chocolate cake. Each sandwich is pressed firmly together so that the ice cream to cake ratio is even throughout. This also makes them easier to eat, preventing the sandwich from melting quickly and giving you the option, if you’d like, to enjoy it on a plate with a fork and knife. Li-Lac Chocolates has been crafting rich and creamy chocolates since 1923. Each treat is made as part of a small-batch using original recipes and fresh ingredients to ensure high quality flavor in each bite. 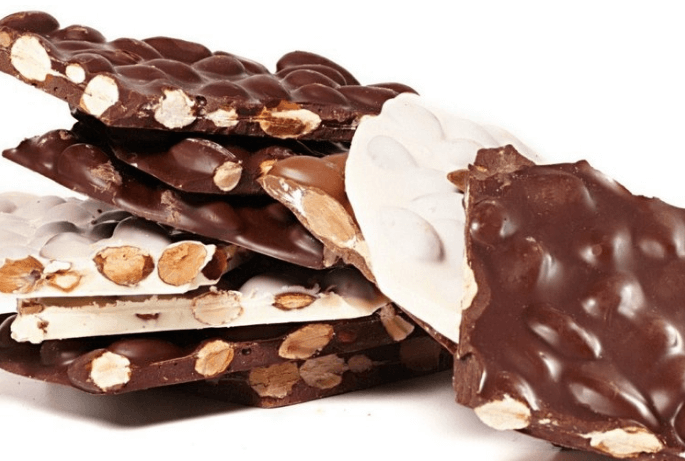 The small bustling shop in Meatpacking is filled with options including chocolate almond bark, salted caramels, chocolate covered oreos and homemade chocolate peanut butter cups. While you really can’t go wrong, if you’re visiting for the first time, the gourmet ganache truffles are a great way to sample one of Li-Lac’s timeless classics. They come in multiple flavors including Mocha and Dulce de Leche. One of the coolest parts about Li-Lac is that while their chocolate ships all over the world and is considered “one of the largest selections of fresh gourmet chocolate in America” it is made locally, right in New York City! Ample Hills Creamery, named for Walt Whitman’s poem on “Crossing the Brooklyn Ferry”, is considered some of the best ice cream in New York and now has an outpost inside of Bubby’s Restaurant in Meatpacking, right across from The Whitney Museum and The Highline Park. Their ice cream is made fresh in the Red Hook, Brooklyn, factory that is technically registered as a dairy plant so they can pasteurize their own ice cream using hormone free milk and cream from grass fed cows. 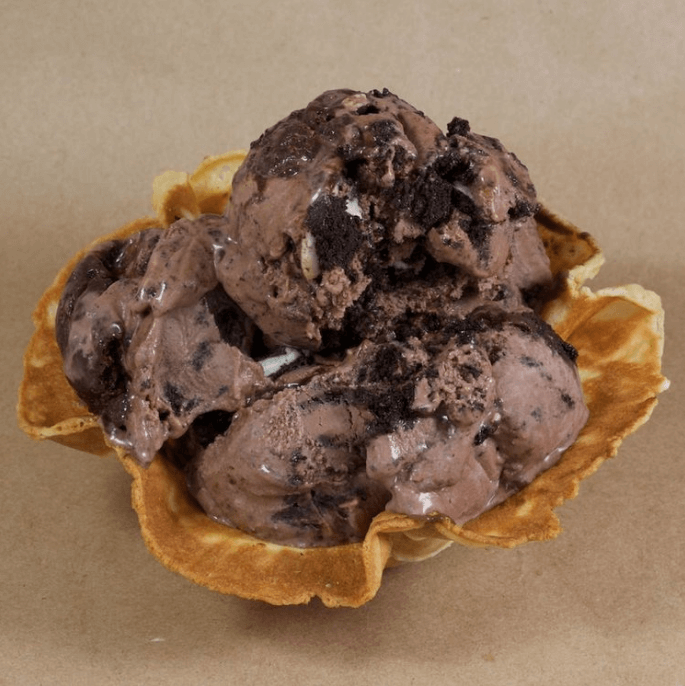 This enables Ample Hills to customize unique flavors like pretzel or marshmallow infused ice creams. While one of the most popular flavors is Ooey Gooey, a vanilla ice cream with hunks of St. Louis-style butter cake, we’d recommend the Milk Chocolate & Cookies. The creamy milk chocolate ice cream is speckled with pieces of sweet Back to Nature Sandwich cookies in each mouthful. Plus, because this shop is located inside of Bubby’s, known for their homemade pies, you can pair a scoop of the delicious ice cream with the famous Chocolate Peanut-Butter Pie for an extra-chocolatey treat. The summer is a great time to explore new neighborhoods, restaurants and most importantly, new desserts! Whether you’re looking for a delicately crafted dessert or a unique version of an old treat, head to the Meatpacking District to treat yourself to a new experience.